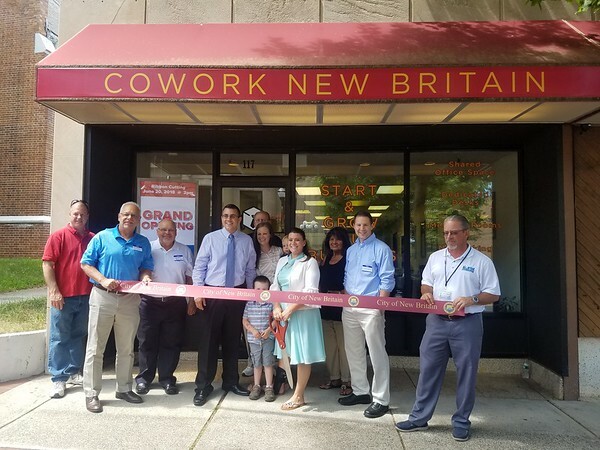 NEW BRITAIN - Mayor Erin Stewart and other city officials joined Cowork New Britain owner Jonathan Johnson on Wednesday a ceremonial ribbon cutting at the new shared working space. Johnson is the founder of the new business, at 117 W. Main St. The idea of the new business is to supply shared office space for businesses and individuals. Cowork New Britain offers a membership that includes dedicated desks, meeting rooms and a space for conferences that will allow members to hold events and seminars. So far, Cowork New Britain has interested two businesses in working at the new space. Former Mayor Tim Stewart, president of the New Britain Chamber of Commerce, praised Johnson for opening a shared working space because there aren’t many like it in the area. In addition, Stewart said, the new business is ideal in terms of the services it provides and its location. Johnson said he started Cowork New Britain not only for his personal growth, but because he wants it to contribute to the growth of the city. John Vasellina is a friend of Johnson and owns a coworking space in West Hartford. Vasellina said shared working spaces are great because they help individuals and businesses support each other. “More coworking is better,” Vasellina said, while wishing the new business to do well. Cowork New Britain can be contacted at info@coworknewbritain.com. Posted in New Britain Herald, Business, New Britain on Thursday, 21 June 2018 20:58. Updated: Thursday, 21 June 2018 21:00.